Loreto Choir joined Glor and Little Belters for the Christmas Lights Switch on, on Chorlton Green on 29th November 2018. 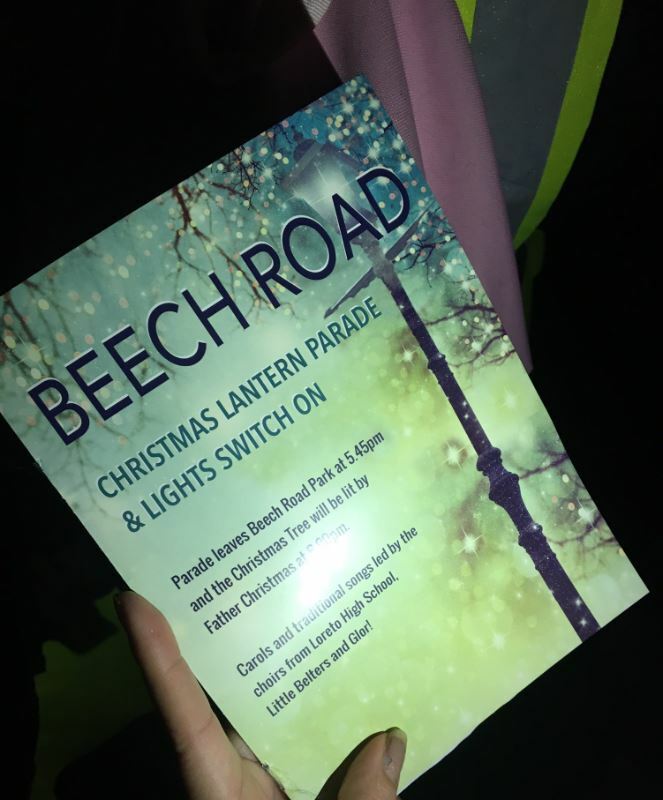 It was a fantastic community event, organised by Beech Road Traders and Richard Glazier (Glor). The Loreto Choir sang 3 solo numbers and joined in with the communal carols, giving a particularly lively and spirited performance. A fantastic evening was had by all. We loved being part of this community event! On 4th December, the Loreto choir and musicians joined with our feeder primary schools for our annual Advent Carol Service at St John’s Church, this year themed around the role of Mary as the Mother of God. All the primary school choirs performed wonderfully as well as the Loreto Choir and soloists from Year 9 and 11, and the audience was amazed by the massed choirs performing Mary Had a Baby at top volume accompanied by the Loreto Jazz Band. There was a beautiful and meaningful message of peace, hope and love, read and acted by students from Loreto, and all the families joined in singing the favourite carols Silent Night and o Come All Ye Faithful. Well done to all from Our Lady’s, St John’s, St Wilfrid’s and Divine Mercy. The Choir was busy again on Friday 14th December, when they attended mass and then led an Advent Carol Service at St Mary’s R.C.Church (the Hidden Gem) in Manchester. They sang a half-hour concert for a packed audience with unusual choices like Be Born in Me, a song about the Annunciation, as well as a modern version of Away in a Manger. Year 9 and 11 bands also sang solos praising Mary. The highlights were the upbeat and jazzy songs accompanied by our excellent Year 10 band which ended the service on a rousing and joyful note: Starlight, Peace Child and Hosanna Rock! Well done to all who performed – you were outstanding and it was so appreciated by all who heard! It was the turn of the Loreto Jazz Band on Saturday 15th December who performed as part of Central Library’s Christmas family open day. The band played a mixture of Christmas tunes such as Frosty the Snowman and Have Yourself a Merry Little Christmas along with Jazz classics such as It Don’t Mean a Thing and the theme tune from Monsters Inc. There was a huge crowd gathered and a generous collection was made to support the Loreto Music fund. It was fantastic to welcome back former student Callum Connell who is now studying Jazz Saxophone at Trinity Conservatoire in London, and especially heart-warming to hear how courageous and disciplined all our young people were with their improvising skills. Thank you to all at Central Library for inviting us to perform once again – we always love it and can’t wait for next Christmas already.